It is about efforts to combat hepatitis-C in Egypt. A carefully worked-out deal with pharmaceutical companies is making it possible for people in Egypt to get access to a drug that they would otherwise not be able to afford, and it is making a big difference. I find it really heartening to think of the sensible decision-making process and the careful scientific study here coming together to make a tremendous difference in the lives of what may be millions of people. This coming-together of inspiration in the original science, willingness in the company directors, good sense in the public officials, and large numbers of ordinary people helping each other out, is the sort of thing that can slowly transform the world. Another good news thought is that green energy is coming close to being the economically best choice in the short term as well as in the long term. There remain issues of intermittent supply and energy storage. But one of the consequences that is an added benefit is the following. Solar and wind energy are more uniformly distributed around the world than coal and oil. Because of this, as renewable resources increase in prominence, there will be a more equal distribution of wealth, and oil-rich nations will no longer hold quite as much sway. May that day come soon. 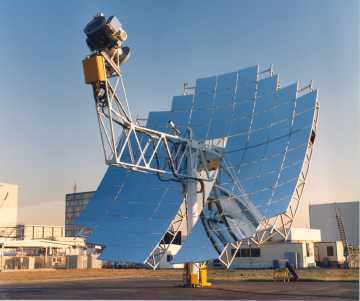 This image is included because solar power comes in two main types: photovoltaic, that is included in the image at the head of the post, and concentrated solar power using mirrors and a heat engine, as in this picture. Both are good methods.